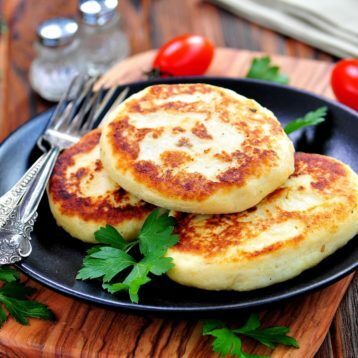 These potato cakes have few ingredients but are perfect for a breakfast with a kick or as side dish to a variety of meals. They are also a great use for leftover mash potato (just skip the steps for making the mash potato in the recipe). This recipe was kindly shared by food blogger EpiVegan for our vegan meal plan. Click the logo below to check out Brett's website! Boil the potatoes until fully cooked. Add the onion, garlic and chilli to the pan and cook on medium-low heat stirring occasionally for a couple of minutes. Add the tarragon to the pan. Add the flour and frying pan contents to the mashed potatoes, season to taste and mix well. Shape the mixture into small patties (should make around 10). Place potato cakes on the pan and fry for about 5 minutes until they turn golden. Turn over and fry for another 5 minutes until golden brown and crispy on the outside.